As a coach, you have many responsibilities and duties. You serve as a mentor, a leader, and role model for not only your players but your community. Below you will find everything you need to begin your journey and provide a positive influence through the world of coaching. Jeff Muhr has been hired as the new MYSA Director of Coaching and will be leading the Missouri Youth Coaching Certificate courses as well as the USSF Grassroots Coaching courses. 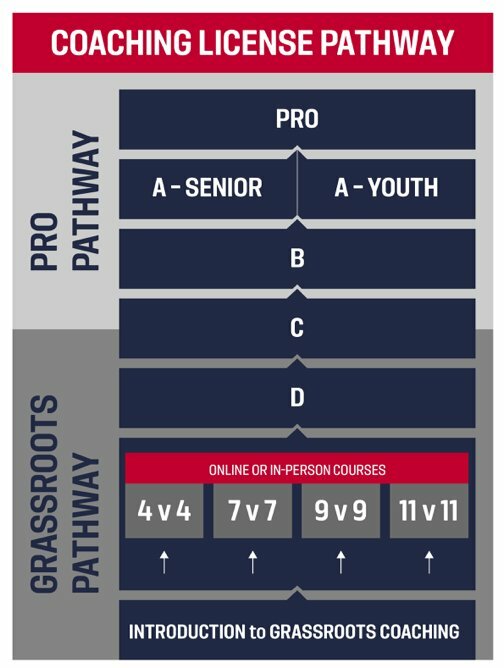 All USSF Advance Courses and the Olympic Development Program (ODP) is supervised by Kirk Nelson, Technical Director for Missouri Youth Soccer. Coach Nelson is also Associate Head Coach of the Missouri State Women’s Program, a Region II ODP Coach and USSF National Educator. He may be contacted via email at [email protected] Questions about scheduling or attending any “D” classes should now be directed to Kirk Nelson. In an effort to further improve the grassroots soccer environment for both players and coaches, U.S. Soccer has restructured the foundation of its coaching license pathway. The new Grassroots Licensing Courses, which replace the F and E License Courses, offer an a-la-carte approach meant to empower coaches with an education that is relevant to their specific coaching needs. The Grassroots Licenses will help coaches ensure fun, enjoyable, and developmentally appropriate environments for their players. MYSA maintains a list of Collegiate Soccer Programs inside the state as a resource for Coaches and Players. MYSA has collected a wide-ranging set of resources to help you in your coaching education, from lesson plans, books, websites, articles, and videos. We’ve collected them in an extensive set of links you can find on our Coaching Resources Page. Let us know if you’ve found something we should add to the list by emailing [email protected]!